The national media spent nearly three months pumping up the drama of a Joe Biden presidential bid -- then watched as the balloon suddenly popped, whizzed and fizzled on Wednesday afternoon in the White House Rose Garden. The speculation over the vice president's candidacy, which began in early August, had reached a fever-pitch in recent days. Correspondents and cameramen staked out the Biden home as reporters scrambled for dribs and drabs from Biden sources. Even among the best-sourced reporters, the conventional wisdom held that Biden was leaning heavily toward a run, but nothing was final -- and indeed that likely reflected the uncertainty within Biden's own head. It was no secret to Washington insiders that Biden wanted to run for president. Biden himself said that he was trying to determine whether he had the "emotional energy" to run, and White House spokesman Josh Earnest said as recently as Monday that Biden was "thoughtfully considering" a bid. "There is no question the media was drooling over the prospect of a Biden-Clinton matchup, because it would have made a pretty dry race more interesting. But this was not a media generated phenomenon. Biden was seriously thinking about it, making real preparations for it, and there was a real appetite from activists and donors for it," Dan Pfeiffer, the former senior adviser to President Obama, told CNN. But in some cases, reporters stretched too far. On Monday, Fox News senior White House correspondent Ed Henry reported that "three sources close to [the vice president]" said Biden was "expected to announce he is running." Last week New York magazine's Gabriel Sherman declared, "Joe Biden is running for president -- a fact that has been obvious, and true, for weeks." On Monday, The Washington Post inadvertently published an article headlined, "Biden to launch a presidential campaign." Wednesday's announcement served as a reminder that in politics the biggest scoops often belong to the subjects themselves. "The main media lesson out of this is that once again on the most important decisions politicians make -- those who are talking don't know and those who know aren't talking," Pfeiffer said. "Everything is rumors and Rosetta Stone reading." The recent media frenzy followed nearly three months of speculation, starting with Maureen Dowd's August 1 column in The New York Times in which she revealed that Biden's late son Beau had pleaded with his father to run. From early August, when the Associated Press reported that Biden was "expected to decide about race after weeklong retreat," to early October when CBS News reported that "Joe Biden could decide presidential run in the next week," the vice president's announcement seemed permanently imminent. Biden's actions fueled speculation. He sat for an interview with Stephen Colbert, where the host told him the nation would be better off if he ran. He appeared at a Labor Day parade in Pittsburgh amid calls of "Run, Joe, Run!" A Draft Biden "super PAC" ran an emotional television ad for Biden's candidacy, and though the Biden campaign had the ad pulled, it stoked the hype surrounding his potential bid. The prospect of the talkative Biden jumping into the race was an attractive story for the press. Throughout the summer, reporters had been chasing a press-averse Hillary Clinton around the country. On the stump, Clinton gave pro-forma remarks, then dodged questions about various controversies, from her private email server to the Benghazi investigation to foreign donations to the Clinton Foundation. With a Democratic field that consisted of Bernie Sanders and a handful of little-known also-rans, the media grew resigned to a long, largely uncontested primary slog. Meanwhile, Clinton was losing support. In the three months leading up to the Las Vegas showdown, her national poll numbers declined by 20 points. By late September, Biden had half as much support as Clinton, even though he wasn't in the race. CNN offered to make room for Biden on its Democratic debate stage in Las Vegas last week. He demurred, Clinton gave a command performance, and Biden's window -- if ever there was one -- shut. 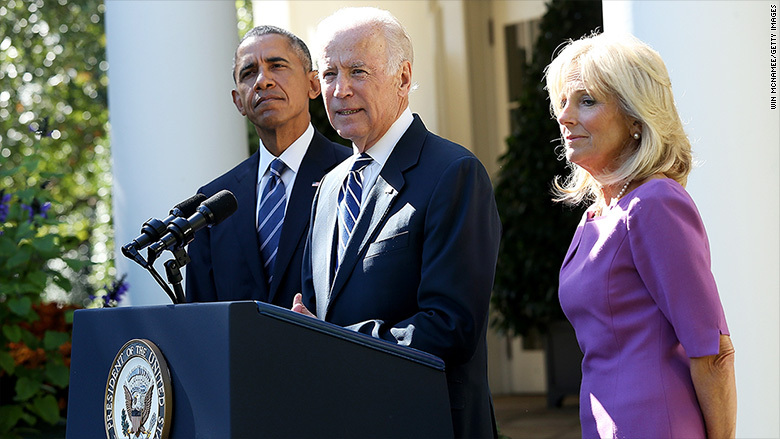 Standing in the Rose Garden early Wednesday afternoon, with President Obama at his side, Biden told the nation, and the press, "Unfortunately, I believe we're out of time, the time necessary to mount a winning campaign for the nomination."